These notes are for your guidance and to help you to maintain comfort and efficiency from your new dentures. Artificial dentures are only substitutes and can never be as efficient as natural teeth. You have spent a considerable time having these new dentures made. Like all new appliances, it will take some time for you to become used to them. You must look after them carefully in order to have a good service. 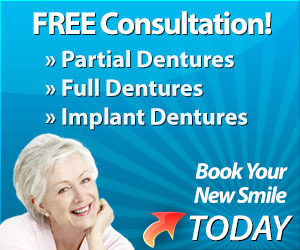 Your Dental Prosthetist will show you how to place and remove your dentures. Be sure you can do this properly before you leave the denture clinic. Even if you have worn dentures before, your new denture will feel strange at first. This is because your mouth takes some time to adapt to the new denture. When eating, start with soft, crisp foods (eg. Lightly cooked vegetables.) Take in small amounts and chew slowly. Try to bite on your own teeth rather than the artificial ones, especially at the front. Bite at the corners of the mouth and not with your front teeth. If possible, chew on both sides at the same time. Dentures should be removed before going to bed, as this gives your mouth a chance to rest. This will help to prevent you from unconsciously grinding your teeth at night. Clean your dentures thoroughly and place them in a glass of water. Ask your dental prosthetist about cleaning agents. A new denture replaces those teeth you have lost. To maintain this healthy condition, it is necessary that you take great care with the cleaning of your mouth, so that there will be a minimum further loss of teeth or damage to the mouth. Your dental prosthetist will show you how to use a tooth brush and dental floss correctly, so that you can efficiently remove food particles an d plaque after each meal. Clean your dentures after each meal in order to keep them free from food particles and plaque. Brush both the inside and outside surfaces with a soft brush and soap. If you normally wear glasses, be sure you wear them while cleaning your dentures and also that you are in a good light. Place some water or a cloth in the basin during cleaning , in order to prevent damage if you drop your dentures while cleaning. DO NOT USE hot water, abrasives, bleach, methylated spirits or antiseptics, unless instructed. If you break your dentures, or damage a clasp, stop wearing it. Telephone your prosthetist for an immediate appointment. DO NOT glue the parts together as the use of an unsuitable glue will ruin the denture and it will be difficult for the prosthetist to repair it correctly. In addition, do not bend or modify a clasp in any way as this could cause it to break. If tartar buildup is noticed, soaking your dentures in white vinegar for an hour will help its removal. If not successful, make an appointment to have your dentures re-polished.